Remember its dangerous place, underwater in outer space. There are lots of bigger fish in this cosmic pond. But Wheely the Space Fish, is no fish out of water - despite being a million miles up. Collect gems and treasure for points, eat smaller fish for extra lives. Avoid anything bigger then you, or with sharper teeth. Fins are great, but to get anywhere fast in the oceans of outer space you need wheels! 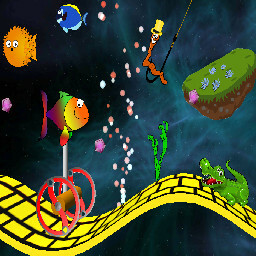 Download Wheely the Space Fish and play now.